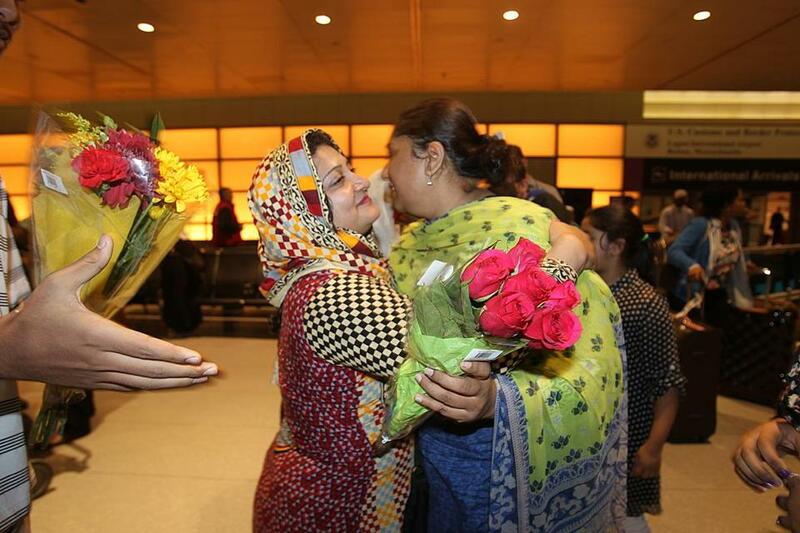 Nusrat Farooq (in scarf) was reunited with relative Saima Alrai, who was on the plane. Five passengers experiencing flu-like symptoms aboard an Emirates flight originating in Dubai were escorted off the plane Monday afternoon by a team in full hazmat suits at Logan International Airport, and other passengers were kept on board for nearly three hours while officials assessed the situation. Hazmat teams responded to Flight 237 at about 2:45 p.m. and escorted the five ailing passengers to two area hospitals to evaluate their conditions, said Matthew Brelis, spokesman for the Massachusetts Port Authority, which operates the airport. It does not appear that any of the sick passengers had been traveling in West Africa, where an outbreak of the deadly Ebola virus has already killed more than 4,000 people, said Brelis, of Massport. 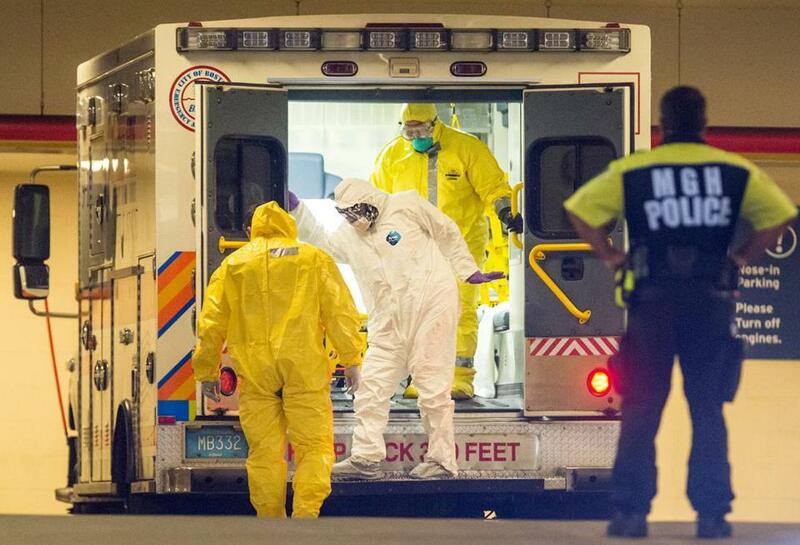 Emergency workers in hazmat suits responded after a plane arrived at Logan airport with five passengers with flu-like symptoms. Two of the feverish passengers were transported to Boston Medical Center, said David Procopio, a State Police spokesman. The other three passengers exhibiting flu-like symptoms did not appear to have a fever, but were still taken to Massachusetts General Hospital, he said. The emergency response at Logan came just one day after dozens of workers and patients were quarantined for hours at a Braintree medical facility after a man who had recently visited Liberia complained of a headache and body aches. A Beth Israel Deaconess Medical Center spokeswoman said Monday night that the hospital’s evaluation showed the man in the Braintree case does not have Ebola. 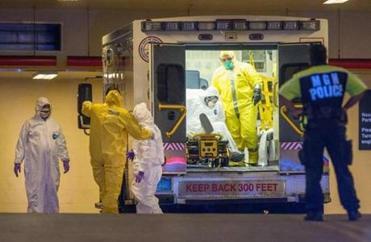 Patients in white hazmat suits arrived at Massachusetts General Hospital. EMS workers wore yellow. As Monday’s events unfolded at the airport, Brelis said, the mass response of emergency crews — it consisted of Massport Fire Rescue, the State Police, Boston EMS, Customs and Border Protection, the Boston Public Health Commission, and the US Centers for Disease Control and Prevention — did not disrupt incoming or outgoing flight traffic at Logan. Officials could not confirm Monday evening whether the five sick passengers were traveling together. However, Mandy Mohan, who was on Flight 237, said a group of tourists on the plane who seemed to be traveling together were the focus of the health inspectors. “One of them was kind of sick, so they were checking for symptoms, checking what their temperature was, and stuff like that,” Mohan said. Mohan said he could see a large assemblage of emergency response crews outside of the plane and dozens of people wearing protective gear. The remaining 182 passengers and 19 crew members began trickling off the plane at about 5:30 p.m. and then cleared customs, according to a statement from Massport. Many passengers hugged family members who were awaiting their arrival outside of the baggage claim area. Maimoona Shaikh was waiting with her husband for their family members, who traveled to Mecca for the Hajj and were coming back on the Emirates flight via Dubai. Kumar Pal, 35, of Boston, who was also on Flight 237 after traveling from India via Dubai, said the thought of Ebola had not crossed his mind during his travels abroad — not until he landed in Boston and hazmat crews abruptly boarded the plane, that is. “They were all in [hazmat suits], so some people became worried about the possibility of an infectious disease,’’ Pal said. Trisha Thadani can be reached at trisha.thadani@globe.com. Follow her on Twitter @TrishaThadani. Todd Feathers can be reached at todd.feathers@globe.com. Follow him on Twitter at @ToddFeathers.